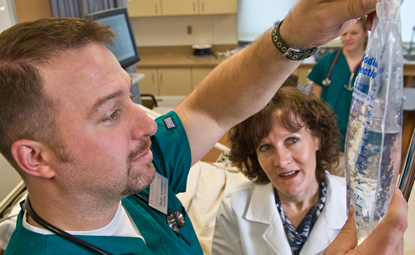 Students who choose a course of study that will lead to an eventual career as a physician assistant will work with a dedicated adviser to customize a program that increases their chance of admission to a licensing program. You'll build a foundation for the education and training it will take to practice medicine under a physician's supervision and conduct exams, diagnose and treat illnesses, order and interpret tests, assist in surgical procedures, counsel patients on preventive health care issues, and write prescriptions. Well-rounded program of natural sciences, humanities, human development, social sciences, statistics and medical terminology courses. Completion of a comprehensive major or major/minor combination highly recommended. Assigned faculty adviser assists with course selection and preparation for competitive admissions requirements of professional schools. Smart classrooms, technology-enhanced lecture halls and advanced laboratories in the updated Robert H. Wick Science Building, the center for most pre-professional programs. New anatomy and physiology suite in a remodeled Wick Science Building is open weekdays. A Human Performance Lab with advanced equipment and an international reputation of excellence. High success rate in admission to professional schools. Chemistry program is approved by the American Chemical Society. $126,000 2014 National Science Foundation grant for research on aquatic ecosystems in Chicago's waterways. Emphasis on science and technology that includes completion of $45 million Integrated Science & Engineering Laboratory Facility (ISELF), $14.5-million addition to Robert H. Wick Science Building and $13.6-million renovation of Brown Hall completed within the past five years. Earth Day Half Marathon draws thousands interested in healthful activity to the campus annually. Health-focused campus activities such as UChoose, Relay for Life and Students for Health.